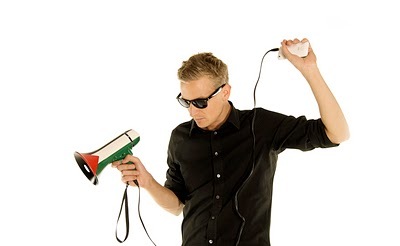 Artist Emil McAvoy is responding to veteran human rights protestor John Minto’s recent arrest and the police confiscation of his loudhailer by launching the MintoPhone. The MintoPhone is a hacked loudhailer which connects to an iPhone. The iPhone speaks text including Twitter feeds through computer voice generators, and can also play music and sound files through the loudhailer. Minto was recently arrested for alleged disorderly behaviour during a protest against the participation of Israeli tennis player Shahar Peer at the ASB Classic Tennis Tournament. Minto and seven others will appear in the Auckland District Court this Thursday 1st April to face charges. Minto and others had their loudhailers confiscated, and are attempting to have the charges dismissed and their loudhailers returned. Minto also had his loudhailer confiscated during his 1981 anti Springbok tour protests, which was destroyed by police before it was returned. To celebrate the launch, McAvoy will be performing with the MintoPhone at undisclosed locations around central Auckland on Thursday 1st April from 9am until 12pm using sound generated from the text of Minto’s court submission, public comments on Minto’s recent protest sampled from internet blogs, the live Twitter feed and selected music.